Learn more about Sailing at SHYC: Junior Sailing, Junior Racing, Wednesday Night Racing, Ladies Sailing. SHYC Club-Owned Boat Usage Policy: This policy pertains to our Club-420, FEVAs, and BICs – read our policy. Women’s Sailing Classes: Please join us for a women’s sailing clinics on Tuesday evenings from 6 to 8 pm. This program will run from June 26 to August 7th (no session July 31). 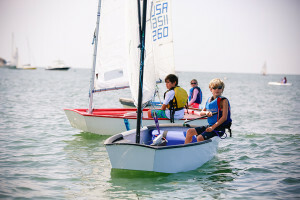 Amy Vinciguerra, our club’s new head JR Sailing Coach will be assisting us and we plan to use the Club’s fleet of 420s. (We may also use an Ideal 18 or other boats depending on interest and participation by boat owners.) ALL levels of experience are welcome. This program is designed to allow participants to improve sailing skills and build confidence by working together and supporting each other. Our focus will be on learning by doing. We will pair beginners with those who have participated in the past with the goal of getting everyone out on the water enjoying the breeze. The cost per evening session is $25 to be billed to your account. Space is limited to 12, with a minimum of 4 ladies needed to run each individual session, and you must sign up for 2 or more classes to participate in this program. To register please use this form = SHYC Ladies’ Sailing 2018 Sign Up. Learn more, print the flyer as PDF. Sachem’s Head Yacht Club is a US Sailing MVP Club! Sachem’s Head Yacht Club is an US Sailing MVP partner. Because of this partnership, SHYC members receive up to 20% off annual US Sailing memberships ( Youth $20, Individual $50, and Family $75). 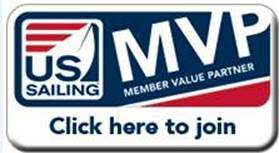 In turn, our club receives MVP credit to expand access to US Sailing resources and programs that help enhance our club. MVP credit can help our club in many ways: Train Level 1, 2, and 3 sailing coaches to strengthen our sailing programs, certify powerboat instructor to teach others at our club, host race management seminars or safety seminars, send club representatives to the US Sailing Leadership Forum, and/or purchase sailing program materials, supplies and prizes from the US Sailing store. Join US Sailing today at a 20% discount, as part of SHYC’s US Sailing MVP program.